Not only is HTC's Legend their best-looking Android phone to date, I'm going to throw my hat in the ring and say it's the best-looking Android phone period. Created from a single piece of aluminum, it's more than MacBook-esque. 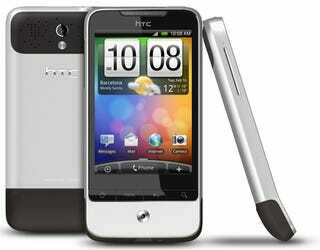 Running Android 2.1 with HTC Sense, it's got a 3.2-inch AMOLED screen with 320 x 480 pixels, capacitive but of course. The camera is 5.0-megapixels with autofocus and flash; there's a 600 MHz processor and 512MB ROM (with microSD card slot), 384MB of RAM. The battery is 1300 mAh, so a bit less than the Hero, and the usual Wi-Fi, Bluetooth, and GPS are included. The aluminium body replaces the Hero's Teflon coating, and while it might be susceptible to scratching from keys or loose change, it certainly adds a premium look to the device. When we first used the Hero earlier in 2009, it was apparent that the phone had some serious firmware issues - we're happy to report that the Legend doesn't suffer this way, at least not from the outset. The capacitive 3.2-inch HVGA screen might look a little bigger, but that's because the phone is actually slimmer and thinner than before - HTC tells us this is because it's been able to save space by making it all out of one solid block, thus removing the need for a frame. Another upgrade to the screen is the fact it's now an OLED rather than your conventional LCD - this means vivid colours and drop dead gorgeous contrast ratios like those seen on the Samsung Jet. We can't wait to try watching an extended video session on this device. One interesting thing to note about the Legend is that it's got a few new tricks up its Android sleeve. A "helicopter view" which is almost like Mac OS X's exposé means you can pinch the screen to view all the five Android homescreens, switching between the widgets easily. A new FriendStream scrobbles all status updates. photos and links from your various social networking sites (currently, Twitter, Facebook and Flickr are supported), but you can still use the individual widgets and apps if you prefer. It's out in Europe late March/early April in Europe, with worldwide availability to be confirmed. I've got to say, after getting hands-on with it recently this will definitely be my next Android handset.